A 2011 email from Slater to Carrick Graham and others was sent anonymously to John Key’s office last night. I am maintaining daily communications with Jared Savage at the Herald and he is passing information directly to me that the Herald can’t run and so are feeding me to run on the blog. In the meantime I also have additional information flowing in via my tipline. That information will be drip fed into the media or via my blog. I also spoke at length with the Minister responsible today (Judith Collins). She is gunning for Feeley. Any information that we can provide her on his background is appreciated. I have outlined for her a coming blog post about the massive staff turnover and she has added that to the review of the State Services Commissioner. She is using his review of these events to go on a trawl looking for anything else. 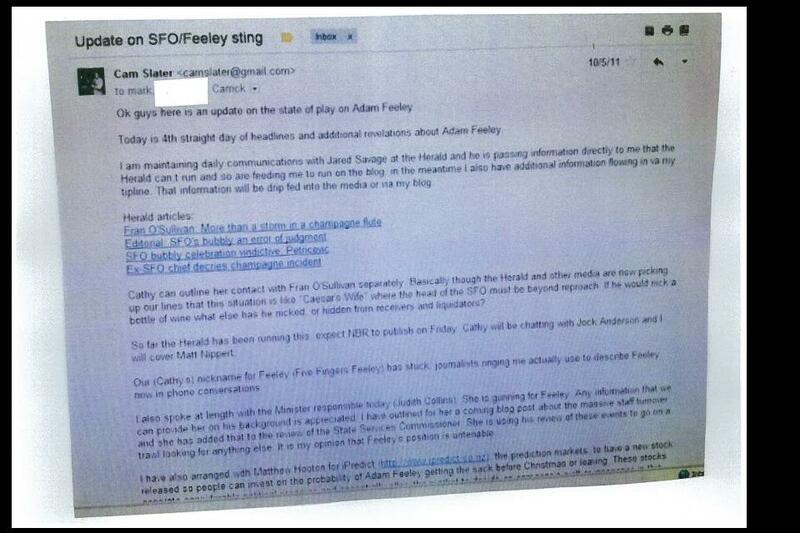 It is my opinion that Feeley’s position is untenable. Given the allegations in Dirty Politics that Judith Collins was responsible for so many of the leaks that poured through the Whaleoil “tipline”, it’s hard to escape the possibility that Collins was both sending and receiving information regarding Feeley. Even if nothing flowed from her to Slater on the subject, the fact that she was at least briefed by Slater on a smear campaign against the head of the SFO is more than grounds for her resignation. That would be unacceptable from any Government Minister, let alone the Minister in charge of the SFO. Of interest is where the email came from. It wasn’t released by Whaledump, and one would assume that if Nicky Hager had had it in his possession, it would have featured prominently in Dirty Politics. Was Slater hacked twice, or has someone in Slater’s inner circle turned against him? Regardless of the provinence of the email, Judith Collins’ career is now officially in tatters. Since the Oravida story broke, the likelihood of her ever becoming leader of the National Party and Prime Minister was ever-decreasing. Now, the odds have to be as close to zero as they come.